It’s summer season and you shouldn’t scrimp on sunscreens at this time of the year. Sunscreens protect our skin from the damaging ultraviolet rays of the sun. It contains chemicals and minerals that scatter, reflect, or absorb ultraviolet radiation such as avobenzone, octyle methoxycinnamate, titanium, and zinc. But for kids, it is not just about applying sunscreen on their skin before playing outdoors or on the beach. Safety levels should also be a point of concern. Mineral over chemical – Health experts recommend to choose mineral sunscreens over the chemical variety. Compunds found in sunscreens like oxybenzone and octyl methoxycinnamate can cause allergies and even disrupt normal hormone activity. And since oxybenzone can deeply penetrate the skin, it is best to avoid using sunscreens containing such compounds to children as it may affect their growth and overall health. However, if you cannot find mineral sunscreens in your local pharmacy, go for avobenzone and mexoryl (also called ecamsule). Mineral sunscreens have evolved – The common criticism about mineral-based sunscreens is that it leaves a pasty layer on your skin, making your kid look overly white. But newer mineral sunscreens uses micro- and nano-sized particles, so it leaves your skin almost clear. Do not worry about the mineral bits getting into your skin because they generally do not penetrate skin and can easily be removed with soap and water. 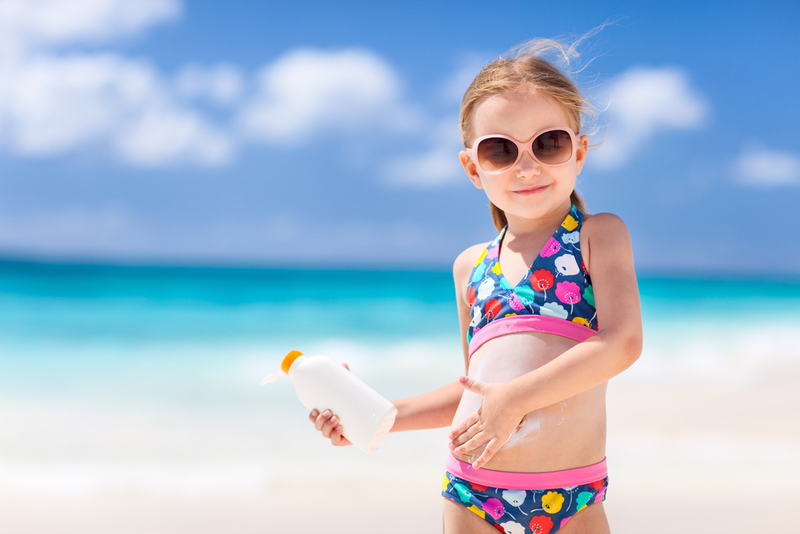 Avoid powder and spray-on mineral sunscreens – Using such products puts you and your child at risk of inhaling the mineral particles, which can cause problems in your respiratory tract. Avoid sunscreens with retinyl palmitate – Some sunscreens have this compound, which the National Center for Toxicological Research and National Toxicology Program recently suggested that it may cause skin cancer if uses in high doses. Use sunscreen on infants sparingly – While skin experts have cautioned against the use of sunscreen for infants under 6 months of age, new guidelines say to apply it in small patches when you bring the baby out in the sun. You can also opt to keep the baby covered with clothing or keep them away from direct sunlight. The SPF myth – Just because some sunscreens offer high levels of SPF does not mean it can completely protect you from the sun. Such products only provide a false sense of security. Experts suggest to go for sunscreens between SPF 30 and SPF 50. Apply sunscreen generously – Reapply the product every two hours and or after being in water. You should also take note how long your sunscreen remains water-resistant; some last for 40 minutes, others for 80 minutes or even not at all.